If you haven’t yet stumbled upon facial cupping, then you may be some what confused. Essentially, they are silicone cups that use suction to help promote circulation. This is turn, helps reduce wrinkles for a youthful look. They aim to tighten skin and improve collagen production. I tried this cruelty free kit from Grace & Stella, available on Amazon for under £20. 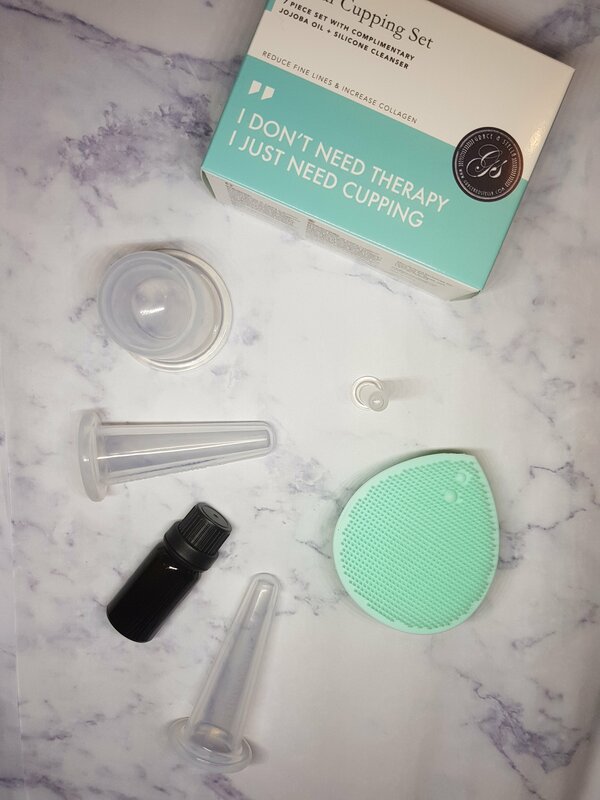 It arrived in a small box, with a cute design and catchy slogan; ‘I don’t need therapy, I just need cupping’. Inside, was a pink pouch, silicone exfoliator and jojoba oil as well as the 7 cups. Next, I tried the smallest cup on a pimple that just wouldn’t go! I do believe it help to extract any ‘gunk’ left behind, but again, left a bruise. Finally, I found the medium cup worked best on my crease lines in the middle of my forehead – this didn’t leave a bruise, perhaps because the skin is less elastic? The instructions do recommend that you squeeze and unsqueeze whilst moving in a continuous motion. This technique takes some practising, but the jojoba oil helps with this. Overall, it does seem to have reduced my crease lines, but I won’t be using it on my lips like Kylie Jenner any time soon! I’ve since use the larger cup on my shoulders and it worked a treat! Yes, more bruising, but it eased the tension and was worth it.